The incessant demands of the phone woke me at 5 a.m. one Monday morning. I muttered a sleepy ‘Hello’ and wished whoever was ringing not very polite thoughts. It was Max Brennan, the trapping contractor for removal of horses from Guy Fawkes River National Park. “We’ll be there asap,” I replied and in record time the ‘residents’ were checked, hay tossed over the fence and troughs filled, the float was hooked up and we were on our way. It was the hottest day on record for late November, there were road works going on and traffic was held up for over two hours on the highway. The ute overheated and we were further delayed a few more hours. The track into Guy Fawkes had deep ruts and steep inclines and negotiating this with a float on behind was horrific. We finally arrived at Tallagandra depot around 1 p.m., hot, exhausted and hungry. The trip had taken over six hours in extreme heat and we couldn’t use the air conditioning due to overheating with the ute. We were not happy. All our own troubles were instantly forgotten as we met our orphan filly. What a sorry, sad sight this little baby was. We quickly checked her over; she was standing, just, but very thin and weak. Max helped us load her, she straddled her legs and didn’t move, she had no energy at all. And so we started the return journey. We didn’t think she would survive but Brumbies are tough and this filly had a determined grip on life. Four hours later in unbelievable heat we finally reached Mountain Thyme Brumby Sanctuary. 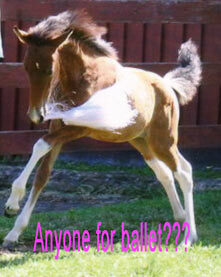 Off came the little filly, stiff and wobbly but otherwise o.k. First things first, out came a large syringe, water and glucose, we had no milk powder on hand, we managed to syringe a fair quantity over her tongue and amazingly, shortly later she shook her head and began to inspect and nibble the grass. That night we checked and hydrated her every hour and by morning she was looking decidedly better. The next day was cooler, what a relief, a trip to the produce store for milk powder and her special foal formula was ready. It didn’t take long for her to get the idea that buckets came with warm milk and she certainly made up for lost time. By the afternoon she was grazing in the garden and meeting the other ‘residents’. The Domestics came up first, it was instant dislike, ears back, snaking at the baby over the fence. 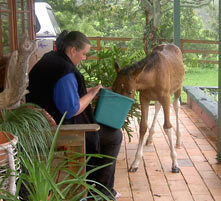 Next, the resident Brumbies, what a difference, they pricked their ears, they nuzzled her, licked her and loved her. Perhaps they recognised one of their own by her scent but it was a very interesting lesson for us in Brumby behaviour. Tallangandra Rose, her formal name as she came from Tallagandra in Guy Fawkes and Rose as she was so beautiful, made great progress. Rosie quickly took over the garden as her own special domain and her four hourly buckets of milk settled into a routine. She became quite pushy with her milk and very demanding; if that bucket didn’t appear on time she would stand on the porch and strike at the door for attention. Her ears would lie flat in her greed for that bucket and a tiny halter and manners had to be taught before she became totally spoilt. The garden became Rosie’s home for many months; without her Mum to protect her from the other horses we wanted to be quite sure that she could look after herself in the ‘mob’. She learnt to lead quickly, picking up her feet, grooming her and putting her on and off the float were early lessons she never forgot. She was a constant source of amusement and interest to our Sanctuary visitors and as she was placed in our Sponsorship program she certainly didn’t lack from admiring attention. Readers can see more photos of Rosie on our Sponsorship link. And so Tallagandra Rose grew up; she is now two years old and has developed into a truly beautiful young filly. Well handled from such an early age she is a delight to have at the Sanctuary and she accepts everything easily in her stride. Her only fault, and one that she is gradually outgrowing as she matures, is a tendency to see every human as a food source, the typical foal trick of laying back her ears at her Mum, ducking under the mares’ neck and demanding halt to access the milk bar is tried out on the humans, “Gimme my food, now …. this instant ….” and this lesson is one that Rosie has taught us, manners must come first, otherwise poddy foals can grow up over confident and rude. The older horses have also taught her well, she has her place in the mob, which is currently last … much to her disgust. The joy and pleasure this orphan filly gives and the pride we have in her far outweighs the hassles, worry and expense that a tiny foal inflicted on us. We acknowledge and thank her Sponsors for their generous donations towards her care.